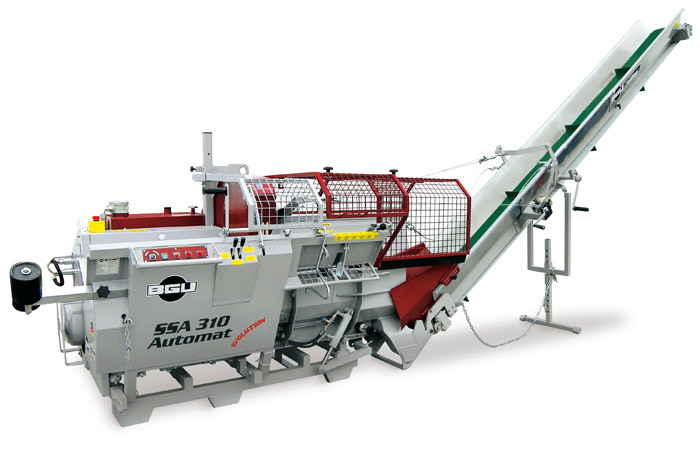 High capacity automatic firewood processor for cutting and splitting logs up to 30 cm/12” Ø! Stand-alone, one-man, self-contained piece of equipment. Cut off operation of logs up to 30 cm Ø is controlledby one man tilting the log carriage over against the saw with very little effort. Logs that drop into the splitter automatically switch on the push block feeding the logs straight against the outlet wedge and splitting then in 2, 4 or 6 pieces depending on which type of wedge is used. Logs are loaded and fed to the blade on a tilting cradle designed with a suitable gradient to provide a firm log support and to muscle the log effortless to the blade. When the tilt-cradle is released and opened, the log can be manually advanced by the operator to start a new cycle. Each piece dropping into the splitter trough automatically starts the pushblock(hydraulic ram) that feeds the log out through the wedge. Sawing/cutting and splitting operations are controlled by two separate, very fast, automatic systems, so that one single man can easily handle. Features 4-ways splitting wedge, standard! Magnetic auto-cycle controls and two-speeds operation valve for shorter splitting cycles.